If you are searching for a way to set your product apart from the rest, you may want to consider branding your T-Shirts with a custom label. AMBRO Manufacturing offers relabeling services. We remove the original manufactures label and can put your labels in before or after printing depending on your specific needs. Our offerings include: Replacing a neck label, adding a hem label or locker tag, adding a sleeve label, or removing all labels. We can do just about anything just give us a call with your specific requirements. Clothing relabeling services adds a huge percieved value to your line of T-Shirts by allowing you to create a fully branded customer experience. Amp up your brand by having AMBRO Manufacturing remove the original tags and labels and replace them with your custom branded labels. Our garment relabeling services are completed, 100% in-house. By controlling the entire aspect of this service we ensure that our customers will recieve the higest level of quality and uber fast turn around on all orders. We know how important your brand is, and we treat it like it’s our own. 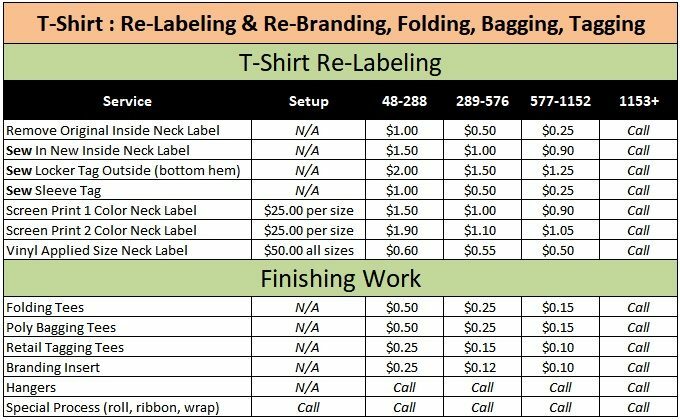 With a low minimum of only 48 pieces, you can have your t-shirts relabeled with your custom labels without breaking the bank. Are you trying to create your own brand? Would you like your t-shirts to look more professional and stand out in a crowded marketplace? We’ll remove the original manufacturers labels and sew in your custom shirt label for that retail look. Your customers will notice and relabeling t-shirts will increase the value of your tee shirts allowing you to sell it for more! Protect and promote your brand with custom t-shirt relabeling services from AMBRO Manufacturing. You created the perfect t-shirt design. You found a high quality shirt to print it on. You toiled over the perfect color scheme. And then, you left someone else’s label in the neck! That’s like seeing the finish line deciding to not complete the race. Give us a call and let’s discuss private labeling. Garment Re-labeling is a custom service that we offer to all clients with orders at or above 48 pieces. We’ll remove the pre-existing label inside of the neck of the shirt and either silk screen or sew in a new custom branded label using your logo and information. You’ve spent many long hours making sure that your t-shirt designs look professional, don’t trip before the finish line. Professional shirt folding and poly bagging of your t-shirts makes your brand truly stand out. We have a low minimum of 48 pieces and graduated pricing. If you have any questions or would like to discuss a project with us, give us a call (908) 806-8337 or contact us by email.